The surface of the Earth feels solid under your feet, but you’re actually standing on a plate of the Earth’s crust. And that plate is slowly shifting across the surface of the Earth. Over geologic timescales, plate tectonics has totally resurfaced our planet, bringing continents together, and tearing them apart. We know we have plate tectonics here on Earth, but what about other worlds? Fraser Cain: Hey Pamela, are you enjoying your summer so far? Fraser: Right so whatever you see from the inside of an airplane that is your summer. Pamela: You know the inside of an airplane can let you see some pretty cool things. Fraser: That’s true. I know you’re going to be in Seattle, the UK, in China. Pamela: [Laughter] Then I am going to South America – 3 continents, one of them twice, in addition to our own so that makes 4 continents in one summer. Fraser: Good. Alright the surface of the Earth feels solid under your feet but you’re actually standing on a plate of the Earth’s crust. The plate is slowly shifting around across the mantle of the Earth. Over geologic time scales plate tectonics has totally resurfaced our planet bringing continents together and tearing them apart. We know we have plate tectonics here on Earth but what about other worlds in the solar system? Plate tectonics is one of the coolest stories. It is the lone scientist railing against the establishment proving the theory, bringing the evidence and turning everyone’s minds to the new theory. Pamela: And it is a theory that is younger than you and I.
Pamela: There is a lone scientist as you quite elegantly put it whose name was Alfred Lothar Wegener. He like a lot of other people looked at a globe and went hmm you really can just sort of take South America and fit it very nicely into Africa. In fact if you have a globe you really hate and you need to do this with a 3-dimensional globe not with a map that has a Mercator projection. Find yourself a really old globe – one that has all the nations of Eastern Europe and Africa completely wrong so you don’t feel bad about destroying it. Pamela: Right, Czechoslovakia. Take a razor blade to the globe and cut out the land. You can actually rearrange the land masses to more or less form one large mega-continent. This had been noticed by Magellan. Pretty much as long as we’ve been able to get all the way around the planet in one piece we’ve known that the continent is fit together in a kind of weird way. People looked at fossils in South America and Africa and discovered that on the eastern coast of South America and on the western coast of Africa, two places separated by a whole lot of ocean, we have the exact same fossils. It wasn’t like it is easy for a hedgehog to hop in the ocean and swim across the Atlantic Ocean. Somehow we were able to get fossils on the same side of both continents or at least on facing sides of the two continents even though the continents were far apart. Coincidentally the continents when cut out of the globe fit together like puzzle pieces. Fraser: There are mineral deposits that start on one continent and then continue on the other continent. Yeah, it is amazing. Pamela: Alfred put forward the idea of continental drift that once upon a time, long, long, long ago, like order of 225-250 million years ago back in the Permian Period maybe all the continents formed one giant continent called Pangaea. Maybe for reasons that he wasn’t completely sure how to explain he said continental drift but there weren’t any forces driving this drift at that period. Something caused the land to tear itself apart and start pulling itself into the continents we know today. During WW II we as a society set up seismic monitors all over the planet. We increased the seismic monitors as the cold war progressed because you can use seismology to detect something under the ground being blown up. We would be able to go investigate this and if you scatter seismometers all over the planet you can do 3-dimensional mapping to figure out exactly where underground either an earthquake originated or a nuclear bomb was tested which was the real reason they paid for the technology. Fraser: How were Wegener’s theories received? He says, knowing the answer. Pamela: No one believed Alfred. They mocked him openly. Pamela: The planet was the way it was and this is after we’d already accepted things like evolution. This was after we had already accepted things like Earth goes around the sun, sun goes around the galaxy. We understood that the big bang existed. Fraser: The Milky Way was one galaxy and that those were other galaxies that were moving apart from each other. Fraser: We knew about how old the universe and the galaxy were. Pamela: Yeah, yet poor Alfred Wegener was mocked. People made fun of him. They said he was wrong. He plugged away at it looking for evidence. He looked at well look at all the seismology; there are clear lines of anger on our planet where we have volcanoes and earthquakes originating. 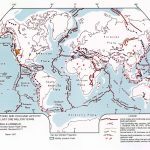 The whole ring of fire – he was able to mark out all these different plate boundaries. If you look at mountain ranges, you can see the different levels of the planet upwelling in these great amazing rifts. You see these when you fly over the continent. He was able to just look at all these different lines of evidence including things like the flipping of the magnetic field of the Earth in some of these levels. Over time slowly he swayed people to believe him. Nowadays with GPS we can look out and go aha, England is moving away at a rate of roughly 3 centimeters a year. This is similar to the rate at which your fingernails grow. Now we believe him but like many new ideas. Fraser: How long did it take? Pamela: It took about a decade. We’re kind of slow to come around to new things occasionally. Fraser: It took about a decade for scientists to go from openly mocking him [laughter] to most scientists being onboard with the theory. Why was it so successful? Fraser: It explained it and amazing wonderful evidence. Pamela: What’s cool is now we can look at maps that are based in part on where we find fossils. We’re able to say we know these continents touched up until the Jurassic Period. We know these continents touched up until the Cretaceous Period. We’re able to follow – thanks to the fossil record – the divergence of the continents. We’re able to basically figure out well go back to the Permian it’s all one continent. Over time things migrated out to being what they are today. Even today we can see Saudi Arabia is working on tearing itself apart right now toward becoming its own land mass separate from Asia. Fraser: Now we have a much better scientific understanding of exactly what’s going on with plate tectonics. What is the story? What’s causing the drift? Pamela: It’s basically we have a hot planet. Things circulate. As the planet is trying to give off its heat we have this layer of liquid rock basically. We have very heavy lithosphere down at the bottoms of the ocean and much lighter materials making up the continents. The continents are able to kind of float around atop of a partial melt called the asthenosphere. We have plates made up as lithosphere with the heavy ones down at the bottom of the ocean. All of this is floating on top of this partially melted layer that is moving very slowly at geologic time scales. We have circulating hot liquid rock underneath. As the heat is released we have the plates moving relative to one another and heat bubbling out in the form of volcanoes at different places along the boundaries of the plates. It’s sort of like you can imagine you have a crusty material on top of a lava lamp. Pamela: Right we found and example the other day online that this is clearly like everyday boiling custard of which I still haven’t seen what boiling custard looks like. I’m going to imagine a big giant lava lamp with crusty nastiness on top of it. As chunks of the thick part of the lava lamp come up to the surface and well back down, the stuff floating on top of that lava lamp is getting moved around. It’s getting broken apart so that heat can escape. Fraser: Right and this is just a result of the fact that there’s still a lot of heat escaping from the Earth. Even though the Earth is cooling there’s still a ton of heat down there. Pamela: Over time the heat that’s being generated from radioactive decays is going to slowly go away as the radioactive material finally uses itself up. Over time the heat that’s still left over from when the planet was formed is going to radiate away. Eventually our continents are going to lock themselves down in a given place. For now, everything is moving around. Fraser: We’ve got sort of two situations, right? We’ve got the places where the plates are coming together and we’ve got the places where the plates are coming apart. Why don’t we talk a bit about that? Pamela: We also have the places where the plates are just rubbing up side-by-side. Fraser: Let’s look at those 3 examples then. Where do we have them coming apart? Pamela: Saudi Arabia is one example of places coming apart. We also have the mid-ocean ridge out in the Atlantic Ocean where everything is completely coming apart. There are all sorts of neat basically black smokers and colonies of really weird critters living down purely off of the heat that’s coming out of this divide down at the bottom of the Atlantic Ocean. Fraser: It kind of looks like a crease where Earth is coming out and going in both directions. [Laughter] Right, Pamela? Fraser: It’s almost like fresh materials. That’s what it is, fresh materials just spreading out from those creases. Then you’ve got the situations where they’re coming together so what’s going on there? Pamela: Where the plates are coming together is where we start getting mountain ranges formed. Currently the Himalayas are still in the process of forming. India is still plowing its way northward. What’s cool is we can actually age where different parts of the planet careened into each other by the height of mountains. The Himalayan Mountains are the tallest mountains in the world and they are the youngest mountains in the world. India is still moving, still creating these mountains very, very slowly. This is where you have the convergence, you have mountains. Fraser: Right. Everest is still getting bigger. Pamela: Everest is still getting bigger. Fraser: You have situations where you get them sliding side-by-side, just rubbing past each other. Pamela: This is one of the problems that we have here in America. The whole western coast of California is trying to move. As California attempts to become more equatorial, you end up with all sorts of earthquakes. Basically the continents build up pressure, build up pressure and we have all kind of experienced this trying to move heavy objects across the floor. You have a heavy cardboard box filled with stuff on the asphalt of your driveway where there’s a lot of friction. You push and push and eventually it just gives and it slides. Occasionally you fall on your knees as it suddenly slides way more than you expected. That’s what happens when you have some of these earthquakes. You have along the fault line pressure building, pressure building and all of a sudden the pressure overcomes the frictional forces between the two plates and the plates slide. You get destruction. Fraser: I actually live on that same fault. I’m a little more north but pretty much right along that ring of fire right along the coast of the Pacific plate. We have the exact same risk up here in Canada where we can have really awful huge earthquakes every few hundred years. Pamela: If you look at a map of the planet that tracks where all of the different motions are going on you have much of America is actively attempting to go west and then California itself is trying to move in new and interesting directions. We have Australia working on trying to move itself north. We have India still working on trying to move itself. Europe is moving over toward Asia. This is where you have the Euro Mountains and the Alps all along in there. The Andes Mountains is where you have the edge of a crust trying to move inland essentially. All these different mountain ranges, all of this is caused by the motions of the plates. It leads to some rather traumatic things both under water and above land that we can see. Fraser: When we did our show quite awhile ago we talked about the Drake equation. If we were talking about how to expand the Drake equation one of the things that you proposed is whether or not a planet had plate tectonics. That could be necessary for life. I was just wondering why that is. Pamela: Plate techtonics aren’t so much a requirement for life but a diagnostic of things that are required for life. We have plate tectonics because our planet still has a molten moving circulating core. It’s these motions inside of our planet that create our magnetosphere, that create the magnetic field around the planet Earth that is able to protect us from incoming cosmic rays. It protects us from the sun and a whole lot of things that could kill us. Fraser: It also runs the carbon cycle. Pamela: Right, we have the circulation of it rains, things die, and things end up in the ground. Over time we’re actually flipping over layers of our planet just like you might till a garden. Fraser: So if we didn’t have the plate tectonics going on the carbon would just all remain on the surface and build up and build up. That sounds kind of familiar. [Laughter] Sounds like some other planet in the solar system. Pamela: Without being able to sequester carbon away underground first of all we wouldn’t have oil. Second of all we kind of would have a runaway greenhouse effect. One of the problems that we’re running into right now is we’re circumventing our planet’s carbon cycle. In a perfect solar system things would die on the surface of the planet and the planet would eventually bury them very deep. It would eventually turn them into things like coal and oil and petrified wood and all sorts of cool things that are far, far away from the surface of the planet. More importantly, they aren’t part of the atmosphere. Fraser: We’re just pulling them under as one plate goes under another plate. Just take it back down under the crust. Pamela: Without this we end up with things like carbon monoxide and carbon dioxide and methane and other complex organic badness building up in our atmosphere. Methane conveniently breaks down in sunlight but carbon monoxide and carbon dioxide don’t. If you get too much of them in the atmosphere the planet will slowly heat up. Right now we’re taking all of that nice friendly sequestered carbon-based material and burning it in power plants. That includes the engine of your car. That’s just a really small power plant. We’re releasing things that should be buried underground back into our atmosphere and we’re causing our planet – at least in part – to slowly heat up. This is bad. Fraser: Right. We know we have plate tectonics here on Earth but what about other places in the solar system? Pamela: When we look at other planets, like Mars and Venus, we don’t see plate tectonics that we recognize. We don’t see the big mid-ocean rifts because they don’t exactly have oceans. We don’t see the giant mountain ranges that are created from plates colliding so we don’t see basically the diverging and converging plates that we see here on the planet Earth. We do see evidence for motion. We do see they don’t have perfectly smooth surfaces and not every mountain is caused by a crater. Not every mountain is caused by a volcano. We do look at these two worlds and see evidence that in the past they did have some level of geologic activity. They may not have had the giant plates that we have but their surfaces certainly moved themselves around and their surfaces certainly were different in the past. It’s just that the majority of the restructuring happened due to volcanism which we talked about in our last episode. Fraser: Right but we talked about the carbon cycle here on Earth and we know that Venus has no plate tectonics so is that part of the problem for Venus? Pamela: Venus is just a whole variety of badness. Fraser: It’s closer to the sun. Pamela: It’s close to the sun. Once upon a time it had water on it but that water got too hot and ended up becoming water vapor. Water vapor is a greenhouse gas. The carbon on the planet ended up in the atmosphere. Now it has an atmosphere that is rich in organics that trap the heat on the planet. It rains sulphuric acid which is just a whole new form of badness. It has hydrochloric acid. It has basically acid in liquid form falling out of the sky. The thick impermeable layer of clouds that we can’t look through in the optical, those clouds also trap infrared heat. Sunlight goes through the clouds and heats up the planet. The rock of the surface of the planet tries to radiate away that heat in the form of infrared. The infrared just basically reflects back off of the clouds building up so that you end up with Venus hotter than the planet Mercury. Fraser: But that heat contributes to the fact that it has no continental drift, right? Pamela: Actually that is part of what’s going on with Venus. You don’t have the same huge temperature gradient that we have here on Earth. On Earth we have circulating hot liquid rock deep in our planet. As it rises, gives off its heat and settles back down it’s this convective process that is driving plate tectonics. On Venus you don’t have the huge temperature gradient as you come up through the rock and then hit really hot atmosphere; really hot surface of planet. Without the huge temperature gradients that you have here on the planet Earth you don’t have any circulation. You don’t have the driving forces that cause the plates to move. Instead you just end up with occasionally the entire planet resurfaces itself all at once as it gives off its heat. Fraser: You have no more carbon cycle so no way trap the heat back under. Things just stay the way they are. Pamela: You end up with a planet that we have trouble landing robots on because they’d melt quickly. Fraser: [Laughter] Yeah, then what about Mars? Pamela: Mars is tiny. People really don’t I think in general understand how small Mars is. Because it is tiny it never really held onto its heat. It’s sort of the difference between taking a giant loaf of bread out of the oven and taking a completely flat pan of cake out of the oven. That really thin flat pan of cake is going to cool off much faster than the big loaf of bread just because it has more surface area compared to the volume. It can radiate its heat through that surface area much faster. Mars just cooled off. It did have some heat, some liquid rock in its center. It just wasn’t enough to get the whole surface of the planet moving around. We can see evidence that it once had liquid rock in the form of the Olympus Mons volcanoes. We have giant volcanoes all in one place all on the surface of Mars, not that they’d be anywhere other than the surface of Mars. They’re all in one clustered area. They were able to grow to be some of the biggest mountains in the solar system. Fraser: Right that’s the Tharsis Bulge. Pamela: Yeah, one giant hot spot on the planet just fed and fed the growth of this mountain set. Fraser: Okay like here on Earth we’ve got the Hawaiian hot spot. You’ve got this long mountain chain or island chain of volcanic islands and that’s one hot spot. You’ve got the continental plate floating over the top of this hot spot and moving. You get cracks in the surface makes an island and then the plate moves and you get another island and so on. I guess on Mars it just never moved. It just kept going and going and going for billions of years. Pamela: What’s really cool is like what we said in the last episode the giant valley set that’s beside Olympus Mons – this is Valles Marineris – was formed with well if you relieve the pressure underneath the crust, if you remove all of the liquid rock from underneath the crust, it’s going to slump. It’s going to crack. That was enough to start this valley. The valley was also cut by water and it’s a complex geologic feature that people are still working to fully understand but I just love the idea that you grow the planet in one place and you have to shrink it in another. Fraser: Last week we talked about cryo-volcanism. Is there sort of similar things happening with like Europa? Pamela: One of the really cool things about Europa is you can actually see how the different parts of its crust move around. You can see the cracking, the striations; you can see the places where the different sections of the ice move apart from one another. You end up with upwelling of fluid. This is very much like the diverging areas that we have at the bottom of our ocean except it is occurring at the surface of a planet that we can conveniently image much more conveniently than we can image the bottom of our own ocean. Fraser: Right and there are big long cracks where you can see the new materials come up from underneath and it is spreading. Pamela: You can see the effects of where different places move relative to one another where you can actually see where a crack used to be a straight line. Two separate sections of ice moved parallel to one another and that crack got split and now one section of the crack is further north than the other section of the crack. Fraser: I think about when you break through or maybe you’re walking through a really thin ice puddle with boots on and the pieces of ice crack open. Chunks of ice floats slide across the top of other ones. It’s sort of a very similar situation going on but it’s with water and ice not rock. I guess the underlying mechanisms are all just the same. You’ve got a difference of energy, you’ve got liquid, and you’ve got solids. Pamela: You have circulation. You have convection. The physics is the same and what’s cool is by changing how much gravity there is and how viscous the material is, you’re going from lava to water. You’re also going from high gravity Earth to low gravity Europa. You can end up with very similar physics. It’s not identical, but it’s close and it’s cool. Fraser: It’s really cool. I think that covers our journey into plate tectonics, way out of your field Pamela. [Laughter] But thanks a lot for. Pamela: I’ve been hanging out with some really cool geophysicists periodically. If you ever want to meet really cool scientists who aren’t astronomers, go hang out with a geophysicist. Fraser: I guess the funny thing sort of is that – a friend of mine was talking to me about this – he says you guys go everywhere because it’s all connected. You have to. We’ve got a bunch of shows planned on biology because it is connected to astronomy, to the search for life and exploration of the solar system and plate tectonics, geology, and all that stuff and physics, quantum mechanics. It’s all connected. Pamela: This is where the word universe comes in because everything is included. Fraser: Right, you talk about everything in the universe. Exactly, I hope the listeners appreciate the wide range of topics we get to choose from. The show on plate tectonics was informative and a good listen. The information about volcanoes on Mars was something I hadn’t known. One blemish on an otherwise well done podcast was the description of the acceptance of continental drift among the scientific community. Wegener was indeed criticized for his theory. Despite a growing body of evidence the mechanism wasn’t yet imagined. Sadly for Wegener he died in 1930 in Greenland and did not live to see his theory triumph. Much of the work in understanding the dynamics of the earth and proving that continents do move about occurred between 1950 and 1960. Source: Wegener, Alfred (1880-1930). World of Earth Science. Ed. K. Lee Lerner and Brenda Wilmoth Lerner. Vol. 2. Detroit: Gale, 2003. p633-635. The story of plate tectonics is an amazing story and worthy of hours of details. Thanks for the wonderful podcast. I can’t say enough about how much enjoy your podcast and how much I have learned from listening to it. I am absolutely amazed at Dr. Gay’s ability to field apparently any astronomy question and provide a thoughtful and factual answer, and to break down rather complex concepts to a level of general understanding (the Jello box as proxy for C-squared in Einstein’s mass-energy equation was brilliant). I have enjoyed all of the shows but the ones on General and Specific Relativity were particularly good at explaining this non-intuitive theory to an educated but non-specialist audience. I also admire the way you expand the term “astronomy” into an integrated big-picture concept, incorporating observational astronomy, stellar “physiology,” cosmology, physics at multiple scales, and recently planetary geology into the whole concept of describing and understanding the universe. And with the mention of geology comes the gee-I-wish-I-didn’t-have-to-say-this slight complaint: I am a geologist and I have to agree with Andy that you made a few mis-steps in your plate tectonics show. I recognize that you were discussing an area that is not your specialty and that you were trying to establish a very basic understanding of Earth’s active plate tectonics so that you could extrapolate this concept to other planets within the solar system, where tectonics work (or don’t work) through somewhat different processes and at different scales. To amplify Andy’s discussion, Wegener (pronoucned with the “V”) was ultimately proved correct in his contention that the continents somehow “drifted,” but because he could not provide a plausible mechanism for their movement, his theories were treated as “fringe” by the early 20th century mainstream geocience community. He died decades before such a mechanism was actually discovered. The mid-century hero of Plate Tectonics was Harry Hess, whose magnetometer data collected near the midocean ridges revealed mirror-image stripes of reversing magnetic orientation imprinted on oceanic crust as it was extruded from the spreading centers and moved away from them. These reversed field stripes corresponded to past reversals in the earth’s magnetic field, thus proving that the crust had been extruded from the ridges/spreading centers for several million years. You mentioned the mid-Atlantic ridge and Red Sea specifically as spreading centers, but failed to note that spreading centers stretch all around the earth, primarily throughout the oceans (since basaltic oceanic crust is generated at them, which, being heavy, causes the oceanic lithosphere to isostatically “ride low” in the asthenosphere). There are some spreading centers on land, generally called “rifts,” most specifically the East Africa Rift Valley. The southwest U.S. Basin and Range region shows evidence of crustal thinning and basaltic lava flows associated with rifting (some as young as 1,000 years old), so it is possible that North America may yet rift apart, forming a spreading center in several million years. Having identified the beginning of the crustal conveyor belt, geologists knew that since the earth wasn’t expanding, this extruded crust must be carried back down into the mantle somewhere. Following the crust away from the spreading centers helped to locate the subduction zones, the deep ocean trenches where cooler (thus denser) crust sank. Multiple types of plate boundaries were then identified, including those where dense basaltic oceanic crust subducted under less dense granitic continental crust (e.g., the Cascade subduction system in the Pacific Northwest or the Andes orogeny in South America). It was soon recognized that the melting of water-wet subducted crust inboard of subduction zones resulted in plate boundary volcanism, either continental or, as in the case of the Aleutians or Indonesia, as island arcs. Plate tectonics drives EVERY geological process on the planet, from volcanism to mountain building to earthquakes, to erosion and deposition of sediments on continental shelves and slopes (thus creating many of Earth’s oil reservoirs), to oceanic circulation and its effect on changes in sea bottom oxygen (and thus on the decay or preservation of organic materials), to the quantity of (naturally derived) greenhouse gasses in the atmosphere. One theory suggests that life on earth may have originated around sea floor spreading centers and deep sea vent communities, which all owe their existence to the tectonic engine that drives this planet. Again, it isn’t my intention to be critical. My comments (and presumably Andy’s) are intended to be a supplement to your show, an expansion on a topic that time and background limited your ability to cover in exhaustive detail. Believe me, any geologist will be happy to talk to you for hours and hours about the hyper-coolness of Plate Tectonics. Please keep up the great Podcast; you two are doing a world of good in spreading knowledge to the rest of us. Glad to find these informative comments in response to another interesting show. I happen to be reading the late Professor S. Warren Carey’s book Theories of the Earth and Universe (Stanford, 1988) at the moment. As some may know, Carey was the leading proponent in the English speaking world of the hypothesis that earth expansion, not continental drift, accounts for the dispersion of the continents. I would like to note a couple of points. First, consider again Mike W.’s words, above: “Having identified the beginning of the crustal conveyor belt, geologists knew that since the earth wasn’t expanding, this extruded crust must be carried back down into the mantle somewhere.” Read carefully, he isn’t saying that geologists know the earth isn’t expanding. The asserted “knowledge” is conditional; it merely refers to a necessary consequence of the _assumption_ that the earth isn’t expanding. It has exactly the same status as the knowledge, given the strong evidence for crustal spreading at mid ocean “spreading centers” around the world, that if crustal subduction is not occurring somewhere, the earth _must_ be expanding. Second, as is well known and discussed here, Wegener’s proposal won acceptance only with great difficulty and after a long struggle (Carey was an early proponent, as it happens). What was the nature of the compelling evidence that finally turned the tide? As discussed in the encyclopedia entry quoted in the first comment, above, and described in more detail by Mike W., this was evidence of spreading, i.e. of continental dispersion. Of course that evidence is equally conducive to Carey’s later views. Recall that the historical controversy was _not_ a battle between Plate Tectonics and Earth Expansion. The latter was not considered, though it had scattered advocates in Germany, Russia and elsewhere. In this connection, Carey quotes a number of other geologists who acknowledge that subduction is very hypothetical compared with the strong evidence for spreading: “The seafloor spreading _hypothesis_ may, for some geologists, require compression in the vicinity of trenches, but the _data_ require horizontal tension” (Professor William Tanner, Florida State); “Quite clearly the understanding we have of the tectonic setting of trenches comes more from concepts of global plate motion than from ideas generated by data gathered in the studies of trenches themselves” (Dr. David Scholl and Dr. Michael S. Marlow, USGS). “The situation is rather this. A scholar makes up his [sic] mind on certain issues over years of intensive study and then comes across a closely-argued book which puts quite contrary views. To assimilate it properly would require considerable time and effort, and if he were finally to accept its arguments, he would have drastically to revise the convictions he has so laboriously built up over a long period. He thus has a double motive for convincing himself that it is not worth serious attention. This will be long, so apologies in advance. What Steven is suggesting here is an alternative to Plate Tectonics called the Expanding Earth theory. This theory originated as one of the early attempts to explain the results of seafloor spreading, prior to the discovery of subduction zones. Most of the literature on the expanding earth hypothesis was published in the 1960’s and 1970’s, with a very few die-hard hangers on continuing to publish into the late 1980’s. It is tempting to respond by noting that virtually no working geologist now accepts this theory, but science is not run by mob rule or democracy and theories – even fringe or hypotheses based on outdated work or negated by later empirical work, do deserve a discussion on their merits and evidence either supporting or refuting them. For you astronomy types, the Expanding Earth theory is geology’s “Steady State Universe” equivalent. I would like to start by challenging the two paragraph quote from G.A. Wells with which Steven ends his posting. Wells is a scholar who is best known for his theory that Jesus Christ is a figure of myth, rather than an historic personage. This is a bit of a leap to geology, but the quote purports to demonstrate a typically human but nonetheless illogical recalcitrance shown by scientists (or experts in any field) when faced with a theory that contradicts the models with which they have worked or helped to construct over the years. Wells cites the case of Wegener and “Continental Drift” and the reluctance with which that theory was met by the early 20th century geological community as an example of this bias. This, unfortunately, is a case of using the wrong example to attempt to prove the right point. Wegener’s theory of “Continental Drift” fell under the category of “extraordinary claims require extraordinary evidence” when it was publicized. Wegener observed that the earth resembled a big jigsaw puzzle. He examined some geology along the complimentary edges of the puzzle pieces, then declared that the continents must have separated and “drifted” over time. Wegener was unable to offer any potential mechanism (the extraordinary evidence) for this “drift,” so, quite rightly, his theories were rejected until evidence of sea-floor spreading and subduction was obtained and interpreted almost half a century later. Wells’s quote targets the scholar who has “made up his [sic] mind….over years of intensive study” then “comes across a closely-argued book which puts quite contrary views” and who would rather reject the new arguments out of hand than revise his own work. In using the term “closely-argued,” Wells seems to be granting alternative hypotheses an a priori legitimacy that may or may not exist (I suspect he was in fact defending his own work from Christian critics, referring to his own work as “closely-argued.”). Wegener’s theory, his “book,” was not “closely-argued,” if by that term we mean an evidence-tested, reasonable hypothesis. Geology, like Astronomy and every other branch of science, advances rapidly. A book published in 1988 commenting on a theory on which work is constantly being done is twenty years out of date, particularly when that book largely describes hypotheses formulated 20-30 years prior to its publication. Subduction is a firmly established mechanism for recycling the earth’s crust. It passes every hypothesis test that is thrown at it and provides a plausible mechanism for orogeny (mountain building), island-arc and continental volcanism (other than those caused by mantle plumes or hot spots), and the origin of the majority of earthquakes and tsunamis. Carey’s laundry list of “anomalies” that subduction theory apparently doesn’t explain is as outdated as it is wrong. It is also representative of the same sort of “negative proof” that creationists use in their attempts to disprove evolution: pointing out one or a few anomalies in a theory that otherwise produces consistent testable results doesn’t disprove the theory. Yes, it is correct that work is ongoing to define and understand the process of mantle convection, but the results of that process are clearly visible in the rock record, and in the dynamic forces that continually impact the earth. Subduction has been verified through the use of crustal tomography, in which large subducting crustal slabs can be imaged as the move down and into the asthenosphere and mantle. The foci of earthquakes also plot deeper as one moves laterally “inboard” from a subduction zone and then diminish as slab deformation converts from brittle to ductile with increasing heat at depth. Subduction predicts the magma composition of island-arc (basaltic) and continental (andesitic) volcanism, depending upon the composition of the subducted slab (and the sediments subducted with it). An expanding earth with no subduction mechanism would suggest that before the oldest known oceanic rocks were extruded, there was no seafloor spreading, thus no oceans (since ocean crust, being denser, rides isostatically lower). This is captured in Carey’s “anomaly” regarding “he total absence of any pre-Jurassic oceanic crust.” If one follows the zones of magnetic reversals away from the sea-floor spreading centers, the oldest oceanic crust one will find is Jurassic (actually late Triassic) in age. And this oldest oceanic crust is located proximal to deep ocean trenches, AKA the subduction zones. But if there was no oceanic crust created prior to the Triassic/Jurassic boundary, how is it that there were oceans prior to that time? In fact, there are voluminous deposits of deep to shallow marine rocks (complete with fossils) on continental cratons that date back to the Cambrian period (~ 540 mya) and older. These rocks result from either deposits in epicontinental seaways, or have been uplifted during mountain building processes, which require plate collisions – in most cases oceanic to continental collisions – which require subduction. Ophiolites, which are the scrapings of oceanic crust transported onto land during (subduction driven) orogenic events, date back well into the Precambrian. If the earth is expanding, should not all of the continents be moving away from each other? How then do we explain obvious plate boundary collisions, such as the Himalayan orogeny, or even the strike-slip movement of the San Andreas fault? Why should anything get shoved against anything else on a beach ball that is continually expanding? If the earth is expanding, shouldn’t the ocean basins be getting larger? And therefore should sea level not be falling? Indeed, shouldn’t relict beach terraces and exposed strand lines be ubiquitous worldwide at high coastal elevations, reflecting the last 200 million years of expanding ocean basins and falling sea levels? And shouldn’t we be able to radiochemically date these geomorphic features and determine that they get gradually older with increased elevation? And finally, if the earth is expanding, ought we not to be able to measure that expansion? Laser ranging is quite accurate for ground based measurements, and GPS satellites should quickly be able to spot whether or not locations on the surface are changing position, a requirement for an expanding planet. Whether or not the planet is increasing in mass via some sort of neutrino conversion is really not the point. Why suggest a mechanism for a theory that has no observational underpinning? The best evidence we have is that plate tectonics, from the spreading center to the the subduction zone, drives the crustal geological processes of the earth. Until someone provides significant data that counters this evidence, there is no reason to abandon or even modify the plate tectonic paradigm. I wish to thank Mike for his willingness to comment so extensively and thoughtfully. I also appreciate his statement that even fringe hypotheses deserve careful consideration. Let us continue the discussion by considering some of the issues he raises. I think the all-to-human problem Wells identifies applies well to both the reception that was originally given to Wegener’s hypothesis (especially in Britain and the U.S.) and also to the expanding earth proposals. Mike seems to think this cold reception was not only understandable, but actually justified, again in both cases. Regarding what constitutes “a closely argued book” – I think Wells’ own work in general is something of a gold standard (incidentally, as is less well-known, he has also written on the intellectual history of geology, notably in his book on Goethe) – but more broadly, my own suggestion would be that such work must adequately take into account all the extant evidence at the time that it is written – regardless of whether that work agrees or disagrees with reigning interpretations of that evidence. By this standard, Wegener’s book gives every appearance of qualifying. It doesn’t matter that he didn’t take into account data that was not available to _any_ geologist of his day. Just look at the chapter headings (the third edition, as translated into English in 1924): Chapter 1 outlines the theory; Chapter 2 relates the theory to other extant theories. Then follow separate chapters covering “Geophysical Arguments,” “Geological Arguments,” “Palaeontological and Biological Arguments,” “Geodetic Arguments,” followed by several chapters on special geophysical topics, and ending with one on “The Displacing Forces” – a discussion of evidence then available regarding possible mechanisms. William Glen, in his classic history of the plate tectonic revolution of the 1960s (The Road to Jaramillo, Stanford, 1982), describes Wegener as “Brilliantly marshaling the evidence then available,” adding that “Much of the criticism [of his proposals] was in fact logically indefensible, but history is replete with examples of purely emotional attacks on bold theorists like Wegener. Although the main argument against drift – the absence of an acceptable mechanism – was sensible enough, many of the strongest critics displayed abysmal command of their own materials” (p.5). Adds Carey, “The fourth edition , incorporating much new data and eliminating some of the weaknesses of the earlier editions, was not translated until more than three decades later (1966), when some Americans had belatedly begun to recognize the validity of Wegener’s work” (Carey, 1988, p. 93). It looks like evidence-based, reasonable science to me. Similarly, Carey gives every appearance of being as knowledgeable regarding the data of his field as any other significant geologist of his day. And the same can be said of some of those who continue to espouse expanding earth theory today, for example, the working geologist Dr. James Maxlow of Australia, author of Terra Non Firma Earth (2005; see his site http://www.jamesmaxlow.com), and Dr. Stefan Cwojdzinski, the Director of the Polish Geological Institute, who furnished the preface to the latter book. True, Carey’s book is of course not up-to-date, and his chapter on “The Subduction Myth,” certainly would have ranked as more closely-argued had it carefully laid out items that are alleged to be the strongest evidence in favor of the subduction hypothesis, instead of just surveying (alleged) serious anomalies. It is important to note that my quotation regarding these anomalies was merely a concluding summary. The chapter itself discusses each one separately, in turn. Mike puts the term “anomalies” in quotation marks, and characterizes the list as a whole as being “as outdated as it is wrong,” or at best indicating minor anomalies that hardly detract from a theory that is otherwise solidly empirically grounded. We will see presently whether he in fact shows that this is so. But first, the important point I want to stress is that the data utilized by the expansion tectonic theorists has all along been the same as that utilized by the plate tectonic theorists. It is the interpretations of that data that differ. So what of the specific objections to Carey’s anomalies? One such that Mike refers to is “the total absence of any pre-Jurassic oceanic crust.” The objection to the subduction hypothesis here is that it is implausible that the subduction mechanism would have been so efficient so as to dispose of every last morsel of oceanic crust that was older than this. As Carey explains, “Plate tectonics assumes that great oceans, covering more than half the earth’s surface, have always existed. More than 200 million square kilometers of such ocean floors is assumed to have vanished since the Paleozoic, and as much again several times during previous eras. Surely we should expect that at least some remnants of these old oceans have escaped subduction somewhere? But no ocean floor is known anywhere older than 150 million years.” Mike is silent on the whole question of whether or to what degree this is indeed embarrassing for the subduction hypothesis. He agrees on the basic factual premise the absence of pre-Jurassic oceanic crust, and instead presents it as a serious problem for earth expansion (i.e. if one does not assume that there was previously existing oceanic crust which is no longer accessible because it was subducted): “But if there was no oceanic crust created prior to the Triassic/Jurassic boundary, how is it that there were oceans prior to that time? In fact, there are voluminous deposits of deep to shallow marine rocks (complete with fossils) on continental cratons that date back to the Cambrian period…” The answer that expansion tectonics gives is simple: prior to the rifting apart of the continental crust which at one time covered the entire globe on a smaller-radius earth, there were shallow seas on the continental crust. After the rifting, the extruding denser, basaltic rocks filling the expanding voids sat isostatically lower – with the result that the shallow seas previously existing on the continents drained into them, the beginning of the modern deep oceans. This explains why ancient marine fossils are found exclusively on the continents, not in ocean sediments. In my first post, a major purpose was to suggest that subduction theory is to some degree uncertain, and thereby support the corollary that earth expansion remains _logically_ a viable possibility. One reason for taking this approach is my own rather preliminary knowledge of the subject matter. But it’s important not to leave the impression that there is “no observational underpinning” for the expanding earth hypothesis. In this connection, let us consider briefly the more recent research of Dr. Maxlow. The basis of his modeling work is a geological map of the world, first published by an international commission in 1990, which differentiates crustal rock worldwide on the basis of paleomagnetically determined age. Typically, rocks get older as one moves outward from the oceanic spreading centers around the world. Colors on the map represent different age intervals. His simple procedure for sequentially modeling successively smaller Earths involves calculating the area on the map of the youngest rock present, reducing the Earth radius by the mathematically corresponding amount, and reassembling the remaining older crust, the youngest rock deleted, on the successively smaller globes. 1. Whereas plate tectonic reconstructions can only assemble Latin American and African continental crusts AND those of North American and Europe by arbitrarily rotating the northern and southern parts of the transoceanic divide, they can be assembled without such artifice on a reduced sized earth. 2. Whereas plate tectonic reconstructions are constrained latitudinally only, expanding earth models based on this data set are constrained both latitudinally and longitudianlly, with well-defined magnetic poles and equators at each stage in the sequence. Moreover, the phenomenon of “polar wandering” is eliminated. 3. Whereas plate tectonic continental assemblages have multiple fit-options, assemblages made by the above well-defined procedures produce a single fit-option at every stage. _All_ of the continental crust fits together accurately at about 52% of the present Earth radius. 4. Not only are crustal motions thus constrained and quantified, but “the mapping also provides us with a means to define mathematically a potential rate of change in Earth radius with time.” This rate of increase in radius is at present calculated to be about 22 mm/yr. 5. The reconstructions thus obtained correlate with paleoclimatic, paleobiotic, and metalogenic data. For example, the merging of the ancient Atlantic-Indian and Pacific oceans (which prior to that had potentially different sea levels) correlates with the final extinction of the dinosaurs (and about 90 percent of non-dinosaur species) about 65 million years ago. As a good introduction, interested readers are referred to Maxlow’s lecture which is serialized on Youtube. Finally it will be valuable to consider Mike’s questions, which for the most part are evidently proposed as objections to the expanding earth hypothesis. “If the earth is expanding, should not all of the ocean basins be getting larger? And therefore should sea level not be falling?” These are good questions. The clear answer is No, at least on the theory that the expansion is produced by a secular increase in mass. The mass consists of atoms, and the atoms are of various types – including those that produce sea-water. Moving from theory to observation, Maxlow reports that the material being extruded from the ocean vents is 15 to 20 percent water and volatiles. “When Robaudo and Harrison (1993) first combined SLR solution UT/LLA9101 (including all data from 1976 to the beginning of 1991) and VLBI solution GBL660 (containing data up to the end of 1990) data sets to determine horizontal motions for plate motion studies, they allowed all stations to have three independent X-Y-Z motion velocities. When these motion velocities were used to establish a global geodetic network, they calculated ‘a Root Mean Squared value of up-down [variation in Earth radius] of over 18 mm/year’ … In other words, the Earth was found to be expanding by 18 millimetres per year. “Robaudo and Harrison considered this increase in Earth radius to be extremely large. They obviously did not consider Earth expansion when making this judgement, but instead compared this to values that were expected from areas undergoing crustal rebound during glacial melting, estimated at less than 10 millimetres per year. One very important principle, which Maxlow has stressed, is that on an expanding earth sections of the crust must continually adjust to lessening curvature. This principle goes part way toward addressing several of Mike’s remaining questions. Picture flattening a half tennis ball on the surface of a softball. Part of the ball will undergo stretching, and part compression. (There we have one answer to the question “Why should anything be shoved against anything else on a beach ball that is continually expanding?”) Furthermore we can readily conceive of the ball-segment cracking at the limits of the the material’s elasticity. Anyway this curvature adjustment principle figures into Maxlow’s explanation of Pacific rim volcanism, as well as of mountain building, though I am not well qualified to explain the details. Moreover, returning to the analogy, the tennis ball’s footprint will also be extended outward over part of the underlying softball crust (“obduction”). It seems plausible that the evidence you cite regarding the alleged verification of subduction would also be subject to this alternative explanation: tomographic images of downward sloping slab, earthquakes plotting deeper, magma composition, etc. It is surely a huge extrapolation to suppose that this evidence demonstrates the existence of a subducting conveyor belt disposing of the same quantities of crust as are known to be produced in the oceanic spreading zones. It therefore seems extremely premature to suggest that this sort of evidence has negated the earth expansion proposals. In conclusion, since Earth expansion is _logically_ the _major_ alternative to subduction, both alternatives arguably ought to be actively investigated together, rather than one of them assumed away. Steven has certainly raised some interesting issues and I can only praise him for the amount of research he has done on this topic. I would also like to add a personal “thank you” for introducing a challenging alternative for consideration; mental challenges are why we choose careers in science to begin with. Science is the practice of increasing our knowledge, of evolving our understanding of our physical reality toward correct answers, or at the least toward correct concepts, for if a conceptual model is flawed, any answer derived from it will at best be a forced-fit. Steven also reminds us of the all-too-human tendency to become comfortable with orthodoxy and our tendency to reject out of hand challenges to that orthodoxy. While such a tendency is, on the face of it, irrational, this behavior does have the effect of acting as a screening process, which forces the proponents of orthodoxy-challenging theories to intensively submerge themselves into scientific examination of their evidence, creating testible hypotheses (and testing them) and ultimately, if they are correct, acquiring and presenting data that is beyond refutation, or at leat can pass the rigorous screening process of peer review. It has been my experience over my science career that for any evolving theory, there are always a few trailblazers who lead the pack (many of whom take wrong turns and get lost), followed by the great mass of working scientists spread out along a continuum of acceptance/resistance to the new theory, followed by the few holdouts, who refuse to accept any change in their orthodoxy. Every member of these populations has value to the advancement of science: the trailblazers challenge (and often annoy) the rest of the group with their creative thinking and challenging new hypotheses, the mass-in-the-middle generate large amounts of research, which ultimately confirm or refute the new-think of the trailblazers, and the foot-draggers, frustrating as they may be, are the ones that force rigor into the process and ask the hard questions. Thus science stumbles forward in fits and starts. That all being said, as far as the expanding earth versus subduction theories, I’d have to put myself in the big middle, probably back near (but not necessarily among) the foot-draggers. I have a (scientific term) “gut” feel that much of what I know about earth science wouldn’t be possible without subduction. I know, for example, that sea level has risen and fallen throughout geological time (based on sedimentological/stratigraphic evidence) and find that difficult to square with a continually expanding earth; I also know that there is pre-Jurassic oceanic crust present in outcrop as ophiolites, which are belts of oceanic crust thrust up during the collisions of island arcs and continents, some of which date back to the Precambrian. Some of the expanding earth conclusions seem a little ad hoc to me: the analogy of flattening the tennis ball onto a softball, while it does illustrate the reduction in curvature that would result, also requires a vertical force to compress the ball, which forces some of the noted results, particularly the rim compression aspect. Again, I will state that this is an initial impression; I have not read the sources Steven cites or any of the countering literature, which I am sure is also present. I will freely admit that my research, training and professional experience have been in stratigraphy and sedimentology, and my exposure to large-scale tectonics has largely been academic rather than in actual research (except as the orthodox applications of tectonics determine the provenance, erosional characteristics, and depositional geometries and fabrics of sedimentary rocks). Perhaps a Plate tectonics expert who reads these posts would feel moved to contribute to this discussion. In the meantime, Steven has provided several references that I shall certainly pursue in my spare time with the goal of eventually posting a continuation of this discussion. Interesting show on plate tectonics. Just thought I’d add a little historical anecdote from my family to fill some more of the story. My father was a geology graduate student after WWII. While in school he attended a special one-week seminar “for graduate students only” on this radical theory of continental drift (as it was known then). After school he became a geophysicist working for the Atomic Energy Commission specializing in logging and mapping uranium resources. During the mid-1950s he was sent to central Africa (the Belgian Congo) to drill core samples and log the results as part of the uranium program. A decade or so later, as plate tectonics (as it had become known by then) began to heat up as a research topic, a young geology graduate student in Brazil named Paulo Barreto began to think about how his native country might have once been connected to Africa. He reasoned that if one were to drill down and pull core samples in both Brazil and Africa, the stratus would reveal the similarities if the two land masses had at one time been one. Looking into the scientific research, he discovered the work my dad had done in the Congo ten years previously. He then recreated the same sampling techniques in northeast Brazil and compared the results with those of my dad’s from Africa. And, lo and behold, he found them to be identical. This ended up being one of the many pieces of mounting evidence that finally swayed the scientific community to accept the theory of plate tectonics. Paulo went on to do his Ph.D. in the United States and spent a summer living with my family while he was serving an internship under my dad as part of his thesis research and that’s when he shared the story with us. Apologies for the delay in getting back to this. Thanks to Mike for his kind words and valuable reflections on the practice of science, as well as for the stimulus of his criticisms. It looks to me that some of these statements are rather theory-laden rather than simply descriptive (can it be otherwise?). Intuitively, I can understand how we might be able to tell that certain igneous rocks were water-cooled, but can we distinguish between “associated sediments” that originated from deep oceans rather than shallow seas? (Or, more accurately, from adjacent land-masses.) Again, deep oceans are something we just have to have, if the continents are moving around on a fixed-radius Earth. But the question is, do the _facts_ require them, if we relax the latter assumption. The text also seems to be describing a genetic similarity between these rocks – found as outcrops on land, notably at “continental sutures,” marking “collision boundaries” – and the mid-ocean spreading zones. In fact, Carey, actually uses the term “genetic similarity” in his comparison between orogens and mid-ocean spreading ridges (Carey, 1988, pp. 243-44). But I remain somewhat puzzled as to how this similarity is supposed to fit into the subduction theory. Shouldn’t the “sutures” at “collision boundaries” consist of the remains of ancient oceanic subduction zones rather than of ancient oceanic spreading zones? The analogy of the tennis ball piece and the softball was my own, not found in my sources, and of course it is crude in some of the ways that Mike indicates. As my description was quite general, a careful reader will naturally ask, as Mike does, whether the principles it was meant to illustrate are a sort of catch-all explanation, without much information-content, or whether they can be (or have been) worked out with the sort of detailed application that would make them fully plausible to geologists. And to Ian: Might your father have been R.T. Dodd, coauthor of an article on radiogenic argon, cited in a footnote on p. 68 of The Road to Jaramillo? Just curious. Steven – It will be a while before I offer anything more substantive to our discussion; I’m doing research. I will get something posted eventually when I can more cogently discuss some of your specific issues. The answer is that the remains of ancient subduction zones are essentially the same as the remains of ancient spreading centers (with more mud on top of them, of course). The mineralogoical makeup and “emplacement stratigraphy” of oceanic crust occurs during its formation at spreading centers; Ocean Drilling Program cores of oceanic crust have identified the igneous succession that you quote. This same crustal succession is then rafted away from the spreading center and eventually ends up subducting. Ophiolite theory suggests that under certain circumstances, parts of this subducting oceanic crust are “scraped” off of the downgoing plate and end up in the melange of oceanic sediments, continental rocks and oceanic rocks that are mashed together at the subduction zone. If those oceanic crustal debris are captured by the overiding lighter, usually continental crust, they may be eventually raised above sea level, so a remnant of what the oceanic crust looks like at the spreading center, having survived its long (or short) traverse from spreading center to subduction zone, become subaerially exposed for us to examine. Regarding deep-sea versus shallow-sea sediments, yes there is a difference, particularly far from land. Terrigenously derived grains decrease with increasing distance from land, while meteoric grains increase in proportion. Tests (shells) of preserved organisms in deeper sediments tend to be more planktonic (water column derived) and less infaunal (bottom dwelling). Many planktonic organisms have shells made from calcium carbonate. Below a certain depth (currently about 5000 feet), CaCO3 dissolves. This is called the “calcite compensation depth.” It is controlled by ocean temperatures and pressures (CaCO3 dissolves more rapidly in colder temperatures and higher pressures, both are generally a function of grater depth), and the amount of CO2 in the oceans (the higher the amount of CO2, the more readily CaCO3 dissolves. [There is a good Wikipedia article on this under “Carbonate Compensation Depth]. The takeaway is that calcium carbonate is practically non-existent in sediments deposited below 5000 feet, so that is a rough and ready way of identifiying deep sediments (since animals with tests made of CaCO3 are ubiquitous in shallow depths ). There is evidence that the CCD has varied in the past, (it became shallower during times of intense atmospheric CO2 from volcanic outgassing) but it is a good indicator of an initial diagnosis of a particular sediment as being deposited in deep ocean waters. Mike – Thanks for your enlightening comments, and the time you have already put into this discussion. They will no doubt help sharpen my awareness as I continue my studies of these matters in my spare time. As Mike W has eminently treated the tested and accepted theory, I’m not going to try to add anything there. But I would like to point out a very basic science error in the comments. The asserted “knowledge” is conditional; it merely refers to a necessary consequence of the _assumption_ that the earth isn’t expanding. It has exactly the same status as the knowledge, given the strong evidence for crustal spreading at mid ocean “spreading centers” around the world, that if crustal subduction is not occurring somewhere, the earth _must_ be expanding. Science can, and does, test theories against predictions to exclude the erroneous ones. Thus in one swell action observations, assumptions and the rest that the theory includes is tested as “good enough”. Here, as Mike points out, expansion contradicts a whole lot of observations while the converse assumption does not. Any amount of details can’t, not even “extra-ordinary evidence”, move that fact any more. Done deal. Flora as one of the evidences of plate tectonic theory is insuffient evidence as it does not explain cross pollination which in one way or another might have contributed to the existance of flora in various continents which have condusive environments for plant growth. Thank you, Torbjorn, and of course I agree with you, but I still think we owe Steven some more actual tests-against-theory results than I have so far offered. I think it important that our science never lapse into dogma, so Steven’s challenge — much as I disagree with the premise of the “Expanding Earth” hypothesis — deserves some answers which involve tests of both theories. I am currently doing a bit of research into that and hope to provide some more information soon. And, again, without disagreeing with your points, I would note that science is not democracy: we may have dozens of of observations that bolster a particular theory, but that theory may be invalidated by a single legitimate counter-observation. I am very skeptical and science-based in my thinking, but anyone who knows the history of geology knows that for years the idea of “Continental Drift” was considered to be a crackpot theory by the geoscience mainstream, which had lots of observations that supposedly buttressed the geosynclinal theory for mountain building without recourse to moving and colliding continents. My point here is that science is a human endeavor, and personal bias, dogmatism, interpersonal relationships and faulty logic do occasionally inform its practice. By the way, if anyone wants to continue this discussion offline and cease filling up the Astronomy Casts’ pages with what is actually a tangential discussion (tangential to their main topic, that is), I can be reached at darwin5056@yahoo.com. If we want to continue it here, that’s fine with me assuming Fraser, Dr. Gay, and their web folks don’t mind. Mike, thank you, and I certainly agree that science isn’t a democracy. It is an elitist market. I appreciate your feedback, Torbjorn. Since the comment from me which you object to expresses a syllogism, I have to guess that what you meant to say is that I am assuming that ‘science is _deductive_.’ I agree that science cannot be a purely deductive activity, and that ultimately it is empirical evidence that must decided the issues. But science certainly does make _use of_ deductive arguments. Since my syllogism here is merely the converse of one that Mike had expressed (with the possible minor equivocation of interpreting his ‘since’ as an ‘if’) I don’t really see how it’s more objectionable than his – or more objectionable than the use of mathematics in science, say. You and Mike are certainly correct that my first post was especially short on empirical evidence. My second pointed out that there are things that can be said in response to the objections which Mike had stated. Naturally others will make their own judgment about the adequacy of these responses, and the status of the discussion. I certainly don’t claim to have Mike’s level of general expertise in geology, only reasonable discernment abilities. You seem convinced that a host of observations contradict expansion, while the converse assumption remains unimpaired. About the first part of this statement, I’ve already had my say, but here I’d just like to reiterate, having listened again to the show, and perused some of the referred show links, how many of the observations that actually are mentioned are quite consistent with Earth expansion. For example, at the point where the show mentioned GPS, it referred to the rate that Atlantic is becoming wider. It also mentioned Australia’s northward movement (which is a way of alluding to the widening of the southern ocean – the increase in distance of the other continents from Antarctica). Evidently, the _need_ for evidence regarding the rate that the perimeters of the Pacific and Arctic oceans are _converging_ did not even occur to the presenters – which in principle would be a straightforward way to disprove Earth expansion. This leads us to the converse question of whether the static-radius hypothesis remains consistent with observations to date. Maxlow points out in the online lecture I cited earlier, that the rate at which new crust is being extruded in the Pacific is about twice the rate of the combined Atlantic and Indian Oceans. Similarly, the apparent lack of evidence for convergence in the Arctic has been dubbed by some the ‘Arctic Paradox’. Are these not at least difficulties for the Plate Tectonic theory? Last night, I had the chance to look at a couple of animations of Plate tectonic models of the history of plate motions during the last 20 percent of Earth history (Berkeley, Enchanted Learning). I dare others to take a look at these and also the model animations produced by Maxlow as attachments to his PhD thesis (which cover almost 100 percent of Earth history) or those by comic book artist Neal Adams (which cover evidence not only from the Earth, but also from the Moon, Mars, Europa and Ganymede), and not harbor seeds of doubt about the Plate Tectonic paradigm. (Links can be had through their respective eponymous websites.) Recall that Maxlow’s models are based in straightforward ways on the UNESCO Geological Map of the World; the pre-Jurassic ones are less straightforward, to be sure, but still follow clearly stated rules (in part involving gradually restoring continental sediments to where they came from). Note that in this model, both the Atlantic and Pacific oceans were closed less than 180 million years ago. Specificially, Australia and North America were in contact at that time. I was interested to to watch the Berkeley animation showing the Atlantic closed at about that time, and Australia converging with North America 800 million years ago. So Plate Tectonics indeed holds that there was convergence of continents around the Pacific, but asserts that the convergences occurred at different times. Quite apart from the superior quality of the growing earth animations themselves, I think they possess a striking simplicity and elegance which the Plate Tectonic ones lack. I wish to thank the Astronomy cast team for their indulgence so far. I will copy this post to Mike’s e-mail, to provide for the possibility of continuing this discussion offline.